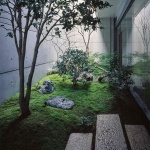 Garden design is the plastic arts with high aesthetic and rich vitality. It inherits the traditional techniques and spirits from the past and also follows the times. 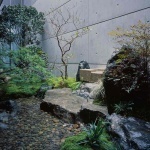 We believe that in the era of pursuing nature and artistic aesthetics, the role of the garden is not only to bring the freshness of nature into the city but more importantly, to create and reserve a vigorous, blooming and artistic place where people can establish the connection with nature while living in the city. The project is built up inside a modern building in Shenzhen, which is a private clubhouse of a local business group. 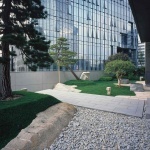 The project consists of 6 gardens that are located in B2F, B1F, 1F, 2F, 3F, and 4F. 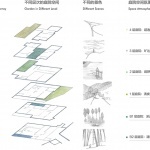 In terms of design concept, the garden on each floor designed with different styles and atmospheres based on the theme of “walking in the mountains”, which also integrates the indoor and outdoor space characteristics, in order to provide some forest adventure experiences to visitors. The theme of B2F: entering the space with freshness and comforts. B2F is the restaurant of the clubhouse. Considering the function of this space, a quiet visual scene is required here to set up an enjoyable dining environment for the users. 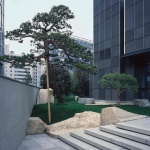 The pines and scattered stones are embedded in the pavement of the open-air outdoor space. 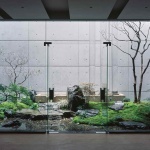 Seen through the large glass windows from inside, the toughness of the stone and the firmness of the trunk with the softness of the moss blend together to form a vibrant frame, gives people the feeling like taking a glimpse of the distant jungle. It is like walking through a pine forest when people walk inside the garden. With the sunshine come down through the gaps of the leaves, mottled tree shadows floating on the floor, visitors can not help but stay to enjoy this picturesque moment. 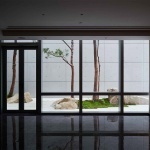 The theme of B1F: the tranquil scenery space. B1F is the fitness room of the club. The sound of flowing water and natural views make people feel like that they are confronting with a quiet corner of the jungle and bring people a relaxable sight while they doing exercise. The fitness room faces the front view of the garden. The rainspout from the original wall of the building remolded to be the water outlet for the garden. 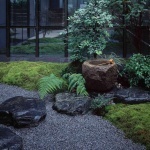 The stone tank introduces water slowly into the center of the space. The water flows through the gap between the stone groups of the waterfall, rippling on the stone to create a babbling sound；falling down on the stone into two streams of water then overflow into the pool. 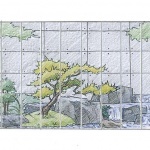 Both sides of the waterfall are plants with elegance shapes. 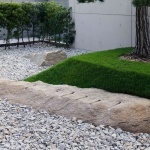 Stone groups and plants reflect radiance and beauty to each other, which not only gives people a rich visual enjoyment but also represents the perfect combination of strength and tenderness. 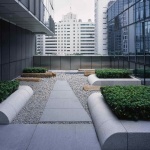 Large stone slats are used in the outdoor pavement that provides some sense of massiveness to space. 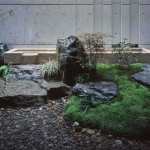 The orderly stone also gives the guide to visitors to find out the falling water behind the tree gaps. The theme of 1F: the fresh and bright welcoming space. 1F is the main entrance of the club and the main space for welcoming visitors. 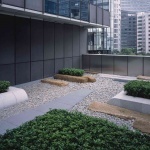 The building facade is simple and modern, so in terms of the garden design, some sculptural stone groups with succinct pavement composed to echo the surrounding environment. Stone steps were designed between the entrance platform and the gate by using the terrain height. The existing height difference problem was solved by mounding slope and overlay some sculptural stone upon the ground to retain soil. 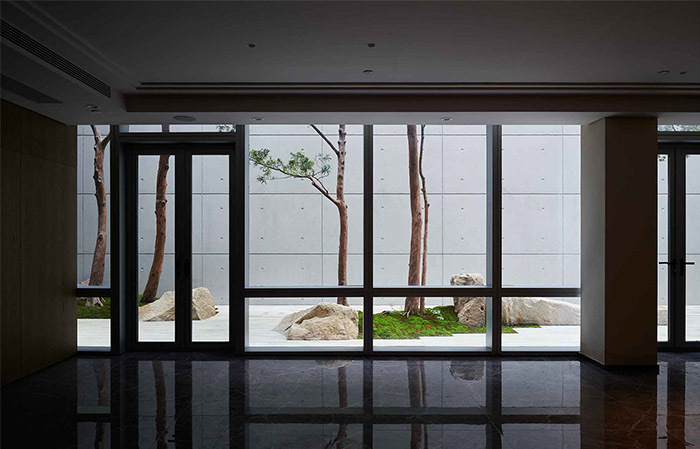 Black pines and stone stand up together to create a welcoming atmosphere in the space. Through a flat organized front passage, visitors get enter into the club. On the right side of the entrance is a modern and simple scenery spot, and on the left side, there is a stone platform designed with messy texture for people to standing. 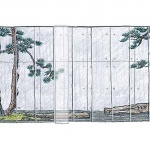 The combination of different materials enriches the garden elements, making the entrance space lively and dynamic. 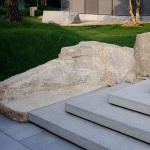 At the same time, the flat granite sculpture stone can be used as a chair, providing some rest spots for visitors. The theme of 2F: the relaxing and comfortable recreation space. The interior space of 2F runs a Japanese restaurant. 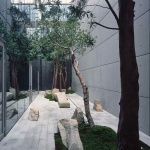 Based on the characteristics of the entire space, the garden is arranged diagonally to creating the depth of field that gives the guests a feeling of crossing the alley and arriving at a mysterious relaxable corner inside the forest. 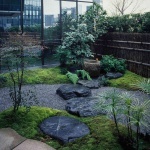 The entrance of the garden is the Ranbari platform made by the yellow rust stone, a small path composed of natural river rocks spread in the middle of the garden. Follow this path into the end, the Tsukubai appears in front of the eyes. 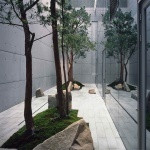 There are some Shrubs planting around, combined with the primitive simplicity Tsukubai, a freshness and elegant scene framed in the space. The theme of 3F: the broad viewing space. 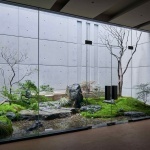 The garden on 3F is next to the living room of the club. 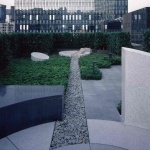 According to its spatial characteristics, some low shrubs and sculptural stone are used here, intended to integrate with the skyscape behind and bring a bracing sense to the visitors. 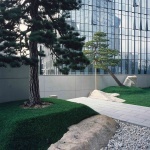 The front pavement of the garden is composed of sesame grey stone. The surface may look simple but every piece of it are treated with unique techniques to create different patterns. 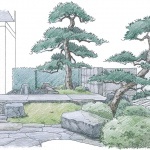 Stepping into the garden, the stone platform with trapezoidal is hovering on the gravel, its upward shape moving the vision to the sky. Meanwhile, several interspersed yellow rust stone standing with its expressiveness format made dynamic connection with distant clouds. The outdoor garden on the top floor provides a quiet and enjoyable space next to the guest room. 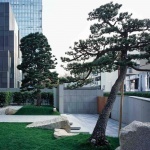 In order to generate the tension and spirituality of the space, few unitary stones with sharp line straight lay on the ground. 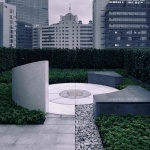 While enjoying the nature on the roof garden, people can find some geometric pattern composed a line spot as the visual focus on the stone pavement, which are not only ensures the display function, but also reshapes the geometry of the space, enhancing the rhythmic experience in the garden, organizing the space elements in a ritual way. Different stones are used here to enrich the surface of the platform. The cool texture composed of sesame black, sesame grey and sesame white stones emphasize the simplicity and solemnity in the space. The stone bench provides a comfortable rest space for visitors, within its polished surface reflects the natural rhythm around it. A yellow rust stone with natural shape is the special decoration in the space that brings the sense of spirituality to the viewers without noticing.